Sweet potatoes are probably my husband’s favorite root crop. We first introduced them to our homestead last year amongst our other veggies in our garden by our house. We didn’t do much other than plant the plants in a tilled up garden like any of the other plants. At the end of the year after the green foliage died we harvested small yields of our first sweet potatoes. Although small, we were still happy because we were somewhat successful. Root crops require special attention. Maybe not to the plants themselves but the soil. We did a lot of research before planting this year and we found a method that seems to be the best! And makes the most sense. Once our shipment of over 100 plants (yikes!) came in we took a rake and made 25′ lines. We made these rows by going down both sides of the line and pulling the soil up about 8-12″. Once we had a huge 25′ long mound of fresh loose soil we took the back of the rake and knocked the peak off making a smooth platform for us to plant the potatoes. 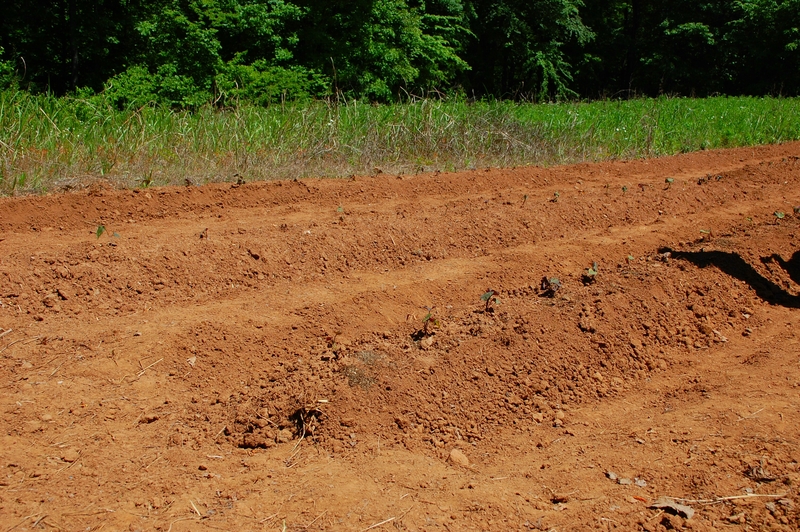 Now keep in mind these rows are made on top of 5″ of tilled soil. Allowing optimum growth for the sweet potatoes. Root crops need loose soil to grow. If you confine them with compacted 5″ deep soil they are not going to grow in a uniform shape or have high yields. Trust me we know! Using our new method of course took a lot longer but only makes sense and I can’t imagine doing it any other way. Adding 8-12″ of soil for these potatoes surely will help them grow to the best of their ability, make weeding easier, and harvesting a breeze. We also planted our seed potatoes, onions, and carrots like this. I’m very anxious to see how everything turns out! You’ve done the right thing and you (Will) yield better crops!!! !